I am fortunate to have a husband that loves my cooking and loves to eat. He tries everything I make and is very agreeable about most of it. But today, I had the privilege of watching my husband cook his first crock pot meal. And it turned out great! I definitely encourage you to offer the crock pot up for family cooking adventures. It’s great to take with you on road trips to save money instead of eating out. It’s a great way to teach kids about cooking because there’s less risk of burning food or fingers. It’s also a great way to add healthier meals into your busy lives. So kudos to my husband for coming up with this great recipe. Maybe he’ll do the dishes, too. Enjoy! 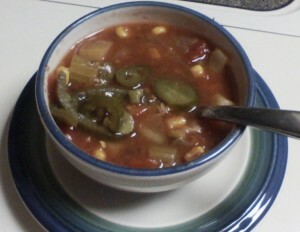 Add all ingredients (except jalapeno slices) to pot and stir. Cook on high for 4 hours. When serving, add a few chilled jalapeno pepper slices straight from the jar, to each bowl. If your man likes it hotter, try a few shakes of Tabasco sauce, too!